LG HB45E review | What Hi-Fi? The design of this LG 2.1 system is something of a paradox. Taking the two speakers (standing nearly 50cm tall) and the subwoofer, this system is, well, pretty darn bulky full stop. 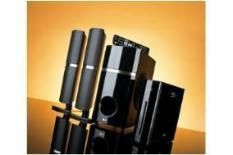 We can't help thinking that this detracts from part of the central appeal of a 2.1 cinema system, and makes the much more petite, PS3-shaped main unit – which, like the PS3, is happy standing vertically or horizontally – something of a busted flush. Still, everything is finished to a high standard and there's an exhaustive specification to match. A clean and clear interface – which, frankly, puts other systems to shame – makes it easy to access all the functions: Blu-ray, DVD and CD playback are all present and correct, of course, and you also get an external iPod dock, DLNA media streaming, LG's Netcast internet-enabled apps, an FM/AM radio tuner and even USB recording, to highlight some key features. In action the LG is something of a blunt instrument, but it still delivers a largely enjoyable level of performance. Watching the excellent Blu-ray transfer of Green Zone, there's a decent amount of detail in the picture, though colours lack a little subtlety. Dialogue can sound a little closed and muffled, but there's plenty of power thanks to that big sub. As we test the DVD performance, the subwoofer does start to get a little boomy, and fast motion sees the LG struggle to keep a firm grip on passing objects. Nevertheless there's still much to like, but we do notice (in quieter moments) that the system's disc-spinner is a little noisier than others in action. There's some variation in prices to be found in this genre, but this LG will sit somewhere in the middle, and while you get plenty of box for your buck, we're not sure the sound justifies the expense. The HB45E is a doddle to use and packed with features – that's two crucial ticks for a system of this type – but with question marks over aspects of performance – and the size of the thing – it's not quite the all-star all-rounder.